At 4 a.m. on the morning of March 28, 1979, a combination of human and mechanical error led to the worst nuclear accident in U.S. history, that in truth wasn’t all that bad. 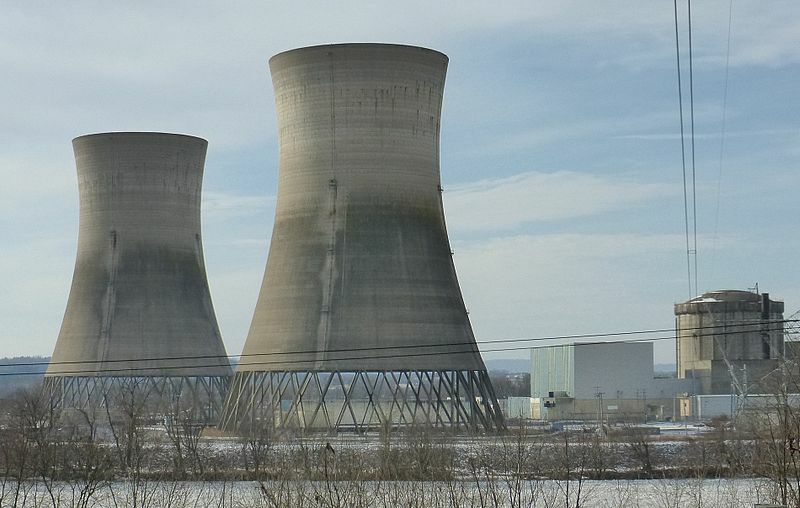 It happened at the Three Mile Island nuclear power plant just outside Harrisburg, PA, and would drastically escalate public distrust toward nuclear power literally overnight. In the end, the accident led to no deaths and no injuries to plant workers or the nearby community. If you camped out at the plant at Three Mile Island during the accident, you’d have received only an additional 80 millirems of exposure to ionizing radiation during the duration of the accident. For reference, if you’ve ever had your spine x-rayed, you’d have received about double that just during the few seconds of the x-ray. If you were around ten miles away from the reactor during the accident, you’d have received about 8 millirems or about the equivalent ionizing radiation of eating 800 bananas, which are naturally radioactive. The Nuclear Regulatory Commission (NRC), The Environmental Protection Agency (EPA), the Department of Energy, as well as other independent groups conducted studies in the aftermath of the accident, and came to the conclusion that for people living near the reactor the average person’s exposure to radiation was negligible. It was stated that in spite of serious damage to the reactor’s core, no adverse health affects to humans, animals or the environment could be attributed to the accident at Three Mile Island. Needless to say, public reaction to the Three Mile Island accident went extremely overboard from what the actual event warranted. This was largely due to misinformation in the press; misunderstanding of ionizing radiation among the general public; and the fact that, not 12 days before it happened, the movie The China Syndrome was released. The plot of the movie was how unsafe nuclear reactors were with just about everyone in the movie but one of the main characters trying to cover it up. The China Syndrome movie title’s concept comes from the premise that if an American nuclear reactor core were to melt down, it would melt through the center of the Earth to China. Getting around the fact that it is actually the Indian Ocean that is on the opposite side of the Earth from the U.S., not China, and the obvious problems with the “melt through the Earth” premise, it couldn’t have been a better timed movie as far as free advertisement through the press due to the Three Mile Island incident. The movie was even nominated for several academy awards, including best actress by Jane Fonda. So what happened to cause the accident? The short of it is: an unfortunate combination of sticky valves, someone checking the gauges without their glasses on and a few bad calls leading to a partial meltdown, which in turn led to the release of radioactive gases into the atmosphere. The radiation leak wasn’t discovered until March 30, and at that time local residents were advised not to leave their homes. There was uncertainty among experts if the hydrogen bubble created by the core materials and the super-hot steam could cause further meltdown or even perhaps a giant explosion. Pregnant women and pre-school age children leave the area within a five-mile radius of the Three Mile Island facility until further notice. His statement did not have the effect of avoiding a panic as Thornburgh had hoped. A visit from President Jimmy Carter, a former nuclear engineer who helped dismantle a damaged nuclear reactor while serving in the Navy, did help. Since the accident at Three Mile Island, not a single new nuclear power plant has been built in the United States. Even so, today about 20% of all electricity generated in the U.S. is courtesy of nuclear power. Ironically enough, even with the occasional accident, nuclear power is one of the more environmentally (and human) friendly ways to produce massive amounts of electricity. For reference, according to a paper published by the Clean Air Task Force, approximately 24,000 people in the U.S. alone each year die from emissions from coal power plants. Further, coal power plants release approximately 100 times as much ionizing radiation per year as an equivalent (in terms of output in wattage) nuclear power plant… that’s not even getting into the carbon emissions. According to a study conducted by ExternE (Externalities of Energy a Research Project of the European Commission) from 1995 to 2005 the environmental impact and associated health costs per kilowatt hour of electricity produced by nuclear power plants is 30 times lower than coal plants, and even lower than solar power when taking into account the entire life cycle (including production). What’s the best given this impact cost analysis rubric? Wind power, which is only about half the cost of nuclear in terms of environmental and health impact. I imagine the extended health risks, costs and environmental damage caused by ‘safely’ storing the spent fuel is not a part of the optimistic assessment of nuclear energy production.